Monte Bello Islands – What An Amazing Trip! I’ve just come back from an amazing trip to the Monte Bello Islands, Exmouth and Karratha with two internationally renowed artists. Larry Mitchell is an artist who specialises in painting seascapes and is well known for his paintings of the Abrolhos Islands. Of course most of you know landscape photographer Christian Fletchers work and he was the other person that I got to travel with so it was a dream come true. We spent two day exploring the Monte Bello Islands and we saw so much wildlife and in all sorts of nooks and crannys. The best part of the trip was watching how these guys view the surrounding area and what they pick up on. Its amazing how they see the world in colours, textures and patterns. Taken from a BK117 helicopter at 1000ft. So what did everyone else get up to on the long weekend? I see Mark and Merv have been wildflower chasing, has anyone else been up in the hills at all? 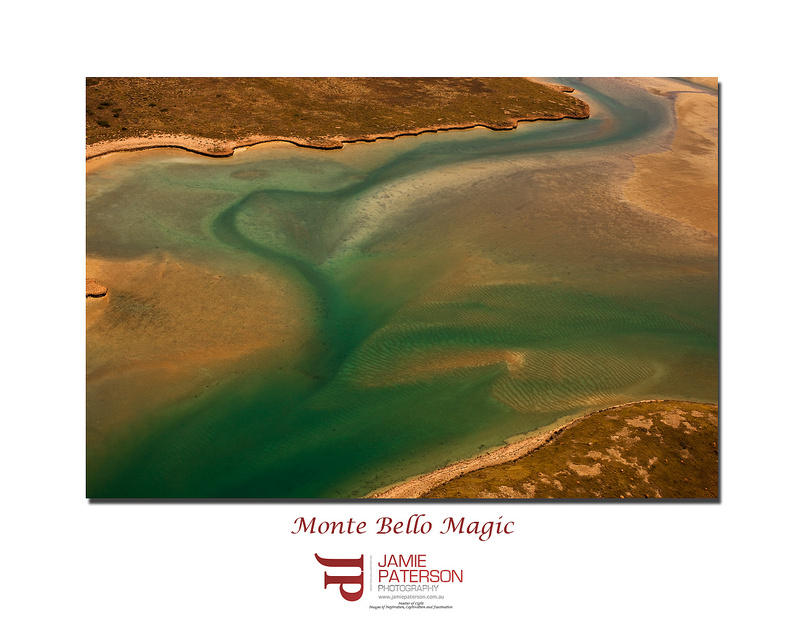 This entry was posted in Australian Landscapes, Australian Seascapes and tagged "aerial photography", Australian Landscapes, karratha, landscape photographer, landscape photography, monte bello islands, seascape photography. Thanks for the comment. Welcome back to ‘sunny’ Perth. We’ll have to catch up soon. No problems about the Lee Filters, they should make life easier for you. That is rather slick shot Jamie, great colours. Thank you very much kind sir. I just loved the greens in the water channels. Nice patterns in this shot mate, I was up shooting wildflowers this weekend too!! Shooting the wildflowers sounds like fun. Where did you go to take them? Plenty to look at in this shot Jamie. Glad to hear you had fun. Thanks for that. I can’t wait to see your next photo! It was more than fun it was a massive learning experience. As always thanks for stopping by. I see what you mean about the green swirl looking like an arrow point, great observation. I can’t wait to show you guys the rest of the photos from the region. Thank you for your comment. It was an awesome trip. Your photos from NZ are pretty cool I’m glad you’re still shooting and posting. They are only internationally renowned. You are universally renowed!!! I thought that went without saying. Your right Jamie. What was I thinking. Got a mention in the Age Newspaper for my vids which was not expected. Someone’s paying attention. Hey well done Mike! I can’t wait to see the teaser from the weekend tomorrow. We gave that helicopter an absolute hammering didn’t we? The chopper stuff came up noooooiiiiiccceee. You wait till you see the teaser. Apache is going to be begging for more. Or else there going to run me out of town. It’s one or the other. I left a message on your phone for your address. Can you email it to me please. Don’t want your fans finding out where you live. HaHa!!!! In referance to your Twit. Home made chips are too hard, they never come out much good and you waste to much oil. Buy a packet and throw them in the oven it’s cleaner and easier, and probably healthier. Looking forward to more shots from this location, come on get your A into G .
Ok mate I’ll take internationally renowned! I’ve been working on Apache stuff all day, have a bunch of crackers, way better than Michaels stuff. Can’t wait to see them Christian. From what I saw on your laptop the other day I was really impressed. Did you like my first Larry Mitchell inspired photo?